Match three magic objects and clear the play field of enchanted tiles. Use swords, Tibetan coins, lanterns, scrolls and other sacred relics. Hurry, because the wick is burning and if it reaches the powder keg, your time is up. Comments: This was an enjoyable match 3 game for the entire family to play. The relaxed mode was nice just to enjoy the game and the backgrounds. Collecting the talismans are an additional benefit to the story line and the game play. Comments: Brightly colored graphics and beautifully drawn pictures highlight this colorful match 3. 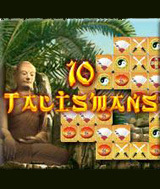 You work a series of levels to obtain a talisman to help you on your quest, there being 10 in all. A relaxed mode is available if you just want to enjoy the game and pictures. I highly recommend this game for all match 3 lovers.